AshleyNewell.me: Holy Smokes, is That Some Mojo? Holy Smokes, is That Some Mojo? 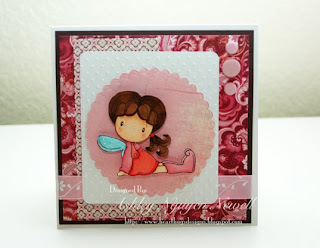 I made this card for the KL Stampin N Scrappin Challenge #15. Now, I usually do like this many layers. And to be honest with you, I actually tried to make this into an A2 card but it wouldn't work. It ended up being a 5.5 inch square. I actually did some fancy coloring today. I thought I forgot how while I was at CHA. All the paper is Basic Grey, Bittersweet. The image is CC Designs. :) Hope you like it too! I LOVE her!! She's perfect!! Shes' adorable girlie! I totally hear ya-I came back from CHA and looked at my stamps and was like, uh, WHAT am I supposed to do w/ you again? LOL! Glad to be back into the groove!!! Very pretty Ash! I love the layers, the colors and your coloring ROCKS! Very cute! Love the coloring and the square card! What a beautiful card Ashley! Your color combo is very lovely and your stamp and detailing are fab! Thanks for participating with the KLSNS Challenge.